Apparently, the stars don’t just come out at night. They seem to have a thing now for sunny South Florida. The field for The Honda Classic, being played this week on the Jack Nicklaus-redesigned Champion Course at PGA National Resort & Spa, is again a marquee list of some of the best, brightest and most popular players in today’s game. Led by World No. 3 Rory McIlory—the 2012 winner—the Honda has assembled a field with four players ranked in the top 10 of the Official World Golf Ranking and 11 of the top-20, including fan favorites such as Phil Mickelson, Sergio Garcia and Adam Scott. The tournament, which tees off Thursday on a Nicklaus course just minutes from the Golden Bear’s North Palm Beach, Fla., home, has the Nicklaus Children’s Health Care Foundation as its primary beneficiary. The Honda Classic will air Thursday and Friday on Golf Channel from 2:00 p.m. to 6:00 p.m. EST. Weekend coverage airs on Golf Channel from 1:00 p.m. to 3:00 p.m. and NBC from 3:00 p.m. to 6:00 p.m. EST. Barbara Nicklaus, the guiding light of the Nicklaus Children’s Health Care Foundation, will be live on NBC Saturday afternoon to discuss the tournament’s impact on children, while husband Jack is expected to make a cameo in the broadcast booth during Sunday’s final round. The star-laden field includes McIlroy, No. 5 Rickie Fowler, No. 9 Patrick Reed and No. 10 Branden Grace. Also playing is 2014 Memorial Tournament winner and World No. 11 Hideki Matsuyama, No. 13 Adam Scott, No. 16 Zach Johnson, No. 17 Brooks Koepka, No. 18 Kevin Kisner, No. 19 Sergio Garcia, and No. 20 Phil Mickelson. Ireland’s Padraig Harrington returns to defend his title. He will challenged by 2015 runner-up Daniel Berger, the former Florida State University standout from Jupiter, Fla., as well as TOUR mainstays such as Robert Allenby, Stuart Appleby (1997 Honda winner), Keegan Bradley, Angel Cabrera, Paul Casey, Stewart Cink, Luke Donald (2006 Honda winner), Jason Dufner, Ernie Els (2008 Honda winner), Retief Goosen, Russell Henley (2014 Honda winner), Russell Knox, Shane Lowry, Ian Poulter, Rory Sabbatini (2011 Honda winner), Vijay Singh (1999 Honda winner), Michael Thompson (2013 Honda winner), Jimmy Walker, Boo Weekley, Mike Weir and Mark Wilson (2007 Honda winner). Also in the field is U.S. Ryder Cup Captain Davis Love III, who last year at age 51 became the third-oldest winner in TOUR history when he won the Wyndham Championship. Exemptions were awarded to Andy Sullivan—the No. 30 player in the world, No. 36 Bernd Wiesberger, No. 46 Matthew Fitzpatrick, Ollie Schniederjans, Tom Gillis, Dicky Pride, Sam Saunders, Nicholas Thompson and Steve Marino. The 15th plays at 153 yards from the blues—179 yards from the tips—and shows a diagonal green running left to right with water all along the right side. A big bunker in the back prevents easy up-and-downs as the green runs away from the bunker and toward the water. Hole 16 is a relatively short par 4 at 391 yards from the blues and 434 for the pros. Well bunkered right and left to present a small landing area, the hole demands accuracy off the tee. Most of the Honda field will use irons or hybrids. The second shot is played completely over water to a large, undulating and elevated green. The 17th hole, at 155 yards from the blues and 205 yards from the Honda tees, is an imposing par 3. From both tees, all you can see is water in front and then a sliver of a green with a cavernous bunker on the left. Even hitting the bail-out area left of the green and short of the trap requires great skill. 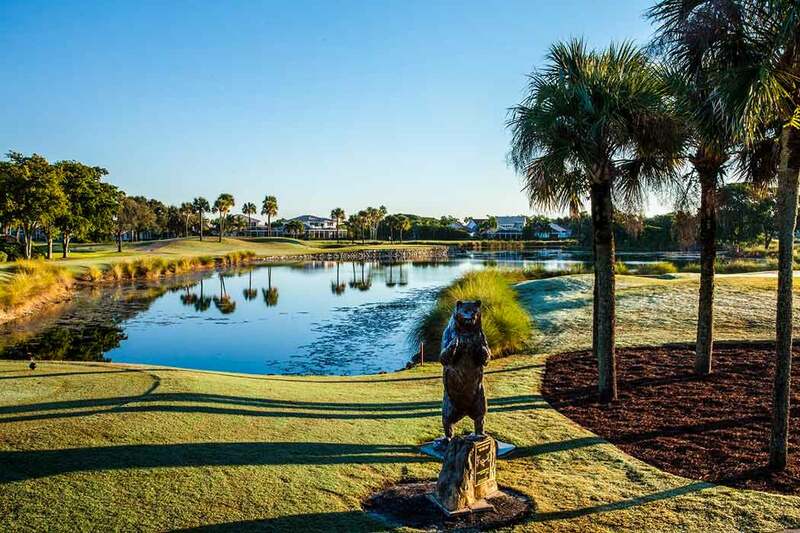 In 2015, Golf Digest rated the Champion one of the top-five public golf courses in Florida. In 2016, Golfweek named the course to its top-100 Best Resort Courses list. Also this year, the Champion received the Sustainable Golf Course of the Year Award in the Americas region by the International Association of Golf Tour Operators, solidifying the resort’s exceptional commitment to the three pillars of sustainable golf: nature, resources and people. The Honda Classic awarded a record $2.555 million in charitable contributions after the 2015 event, about $27,000 more than the previous high of $2.528 million established in 2014. That made it the ninth straight year that the tournament has elevated the impact it makes on South Florida children’s charities through Honda Classic Cares philanthropic initiatives. And this time it was accomplished despite the major expense of cleaning the golf course after incredible storms on Saturday of the 2015 Honda, and opening for an extra day on Monday when admission was free. To learn more about The Honda Classic, visit thehondaclassic.com.